If you have a seat of ArcGIS 10.2 for Desktop current on maintenance, you already have a web GIS. Because your desktop license entitles you to one ArcGIS Online named user subscription and a block of credits. That subscription gives you access to world-class content, tools to make you more productive, and a platform for sharing your work and geoenabling your organization by integrating GIS with the operation of your organization via apps for mobile devices and field force management. Use authoritative basemaps with your data to more rapidly develop maps that answer questions or direct policy. Web GIS is the best way for sharing maps with people in your organization who are eager to use them, whether or not they know anything about GIS. People now expect that they can take maps with them on a smartphone or tablet. ArcGIS Online and the apps it supplies will let them use maps anywhere. They also can use those maps as a starting point for maps they can customize for their own purposes. Because you can do all these things with the web GIS (enabled by your ArcGIS Online subscription), you can take the lead in your organization, not only creating useful and interesting content but also helping others in your organization be more productive. 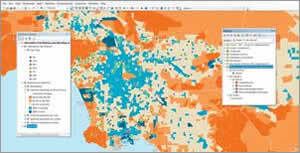 An ArcGIS Online subscription gives you access to a world of authoritative content from basemaps with varying levels of cartographic detail to imagery and maps that provide best-in-class data on demographics; real-time traffic and weather; and land-use, terrain, and soils information that can improve your analysis and speed up your projects. This content is constantly updated and expanded. That same subscription makes tools for working more efficiently available to you directly on the desktop. With the built-in viewer, you can quickly mash up your own data with other specialized layers and basemaps. It also lets you use tools for such tasks as geometric operations, locating addresses, or performing network analysis. Your ArcGIS Online subscription lets you publish the maps and data you create as web services without installing your own server. You can publish web services either directly from ArcGIS for Desktop or from the ArcGIS Online website using ArcGIS Online hosted services. Published web services can be added to web, desktop, and mobile apps. Access online tools for creating service areas via ArcGIS Online. In addition to publishing maps and data as web services, ArcGIS Online provides a mechanism for organizing and sharing that content in a controlled manner through the groups you create. Groups can be private so only those involved in a specific activity have access or published so they are available to everyone. Maps can also be shared by embedding them in web pages and blogs, through social media, or by using them to create web applications. 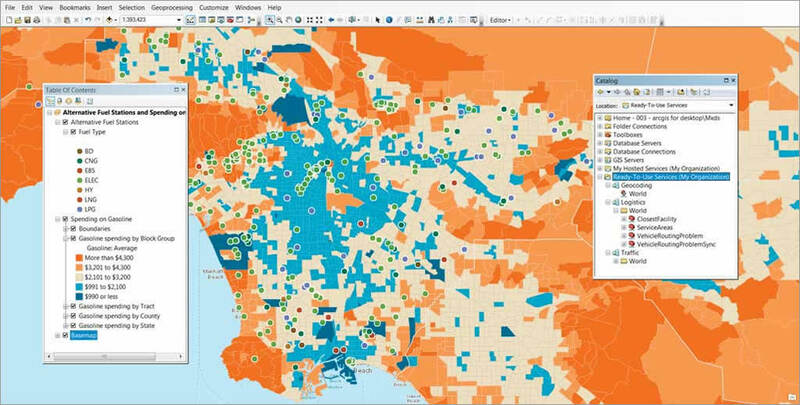 ArcGIS Online includes ready-to-use and configurable web application templates that require just a few steps to set up and no programming. 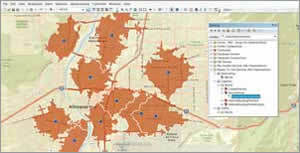 Maps can be accessed from mobile devices using Esri's free downloadable apps for smartphones and tables. ArcGIS Online gives you access to plug-ins that let others use your content in Microsoft Office and Microsoft SharePoint, familiar applications they use every day. They can make maps inside Microsoft Excel or PowerPoint using the Esri Maps for Office add-in or map data on SharePoint using Esri Maps for SharePoint. Two additional apps that come with your ArcGIS Online subscription, Collector for ArcGIS and Operations Dashboard for ArcGIS, can help manage field operations. Use the Collector for ArcGIS app on an iPhone or Android smartphone to capture, update, and report spatial and tabular information; plan routes; get directions; and integrate information back into your organization's GIS. Provide a common operating picture for your organization using the Operations Dashboard for ArcGIS app. Use it to monitor activities and events, track your field work force, and access the status of daily operations. The inclusion of an ArcGIS Online subscription with ArcGIS 10.2 for Desktop is helping meet Esri's goal to build the most stable and interoperable platform for sharing and understanding geospatial knowledge. Now ArcGIS for Desktop, the premier application for creating authoritative spatial content and conducting spatial analysis, is your key to web GIS. Take advantage of your free named user ArcGIS Online subscription to empower your entire organization.